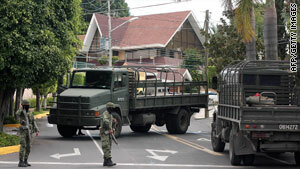 Mexican anti-drug units stand guard after a raid that killed alleged drug lord Ignacio Coronel Villareal last week. (CNN) -- More than 28,000 people have died in drug violence in Mexico since President Felipe Calderon took office in December 2006 and stepped up the fight against organized crime, the nation's intelligence and national security director said Tuesday. In addition, said Guillermo Valdes Castellanos, Mexican authorities and drug gang members have been engaged in 963 gun battles in that time period, or about one per day. The large number of confrontations show that the government is taking the fight to the drug cartels, which previously operated with impunity, Valdes said. Calderon said in April that more than 22,700 people had died in drug violence since he took office. The Mexican attorney general's office said a few weeks ago the death toll for the same time period stood at 24,826. "Calderon and party probably never thought it would get this high," said Samuel Logan, founding director of Southern Pulse Networked Intelligence, an online information network focused on Latin America. "The acceleration year to year is an indication that things are likely to get worse before they get better. We are still on that footing." Still, Logan cautioned that 90 percent to 95 percent on the fatalities are "bad guy versus bad guy." The latest tallies were revealed at a summit Calderon held Tuesday called "Dialog for Security, Evaluation and Strengthening." The president and other high functionaries, academics and security experts met in Mexico City and sat around a large table, calmly discussing the bloody struggle for control of the nation. They painted it as a matter of regaining control and rooting out corruption. Around the same time, firefights broke out in Reynosa, a city in the border state of Tamaulipas. Residents there sat around their computers and posted comments on Twitter about the violence outside their doors. "Shootouts, chases & several blocked highways in Reynosa," wrote Sergio Chapa, a reporter at KGBT-TV in the Rio Grande Valley of Texas, who covers the border region. Said a Twitter user who identified herself as DianaOlga, "Reynosa is in chaos at this moment there is no nextel, the streets are closed you can only hear the bullets." Another person noted that his father had been shot and he was leaving for Reynosa first thing in the morning. Many residents posted photos of blocked roads or people taking refuge during a gun battle. Tamaulipas has seen some of the most violent atrocities since January, when the Gulf and Zetas cartels went to war. The Zetas used to be the armed enforcers for the Gulf Cartel but broke away over a gang member assassination and other matters. Scared residents weren't the only ones tweeting about the violence Tuesday. The city government also took to the web to warn citizens. "Blockades on 20th Street, Soriana Blvd., Morelos, Gemelos Bridge, Libramiento Chedraui. Take precautions until new information," the city government said. About a half-hour earlier the Reynosa government had posted a tweet that said, " RISKY SITUATION continues in VARIOUS POINTS IN THE CITY. It is convenient to PROTECT YOURSELF. Blockades to be confirmed." Earlier Tuesday, an explosive device blew up at an open air market in the city, causing damage to structures but no casualties. At his summit Tuesday, Calderon said the violence could persist "for a while among us." That wasn't welcome news to any Mexicans. But neither was it particularly surprising, especially to those in battleground areas. While the politicians talked in Mexico City, a twitterer who goes by the name of AnnyGirl1 summed up her day. "A sad case, when I thought that things were calming in Reynosa, we woke up to a grenade attack and then 12 hours later a shootout."